This elegant chicken recipe is very flavorful,moist,light and simple to make.It has a burst of roasted garlic flavor in combination of fresh herbs like thyme,oregano and rosemary.Adding Water or stock to the bottom of the pan makes chicken breasts moist and not dry. 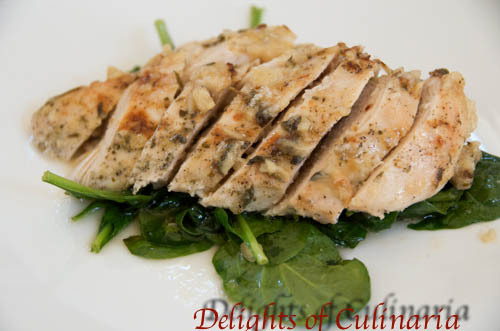 In a blender,pulse 4 garlic cloves and shallot.Add lemon juice,salt,pepper,parsley,thyme,mayo,and olive oil.Mix mixture with chicken. 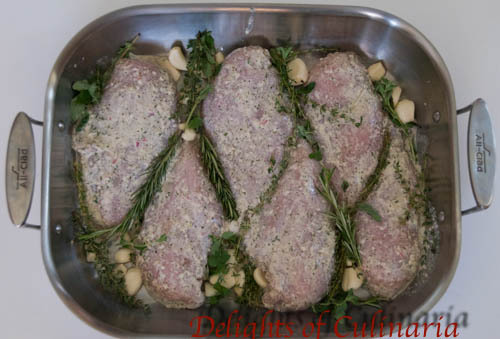 Place chicken in a baking pan.Add garlic cloves and herbs. Add water or stock around the chicken.Drizzle some olive oil.Bake for 50-60 min. in 425 degree oven. Discard herbs.Take out garlic cloves from baking pan, and smash them in a small bowl. Spread garlic on top of chicken.Slice the chicken in the baking pan.Pour more liquid on top. Transfer to a serving plate and serve. Place garlic and shallot in a blender, and pulse few times. 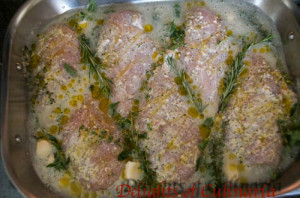 Add 4 garlic cloves,lemon juice,mayonnaise,onion powder,parsley,4 sprigs thyme(stem removed),salt,pepper,and olive oil.Pulse a few times until well combined. 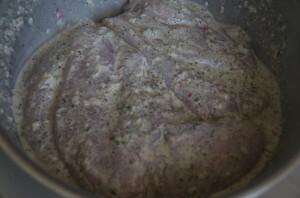 Spread the mixture on both sides of chicken. Place chicken in a casserole dish or baking pan. Add garlic cloves and herbs. 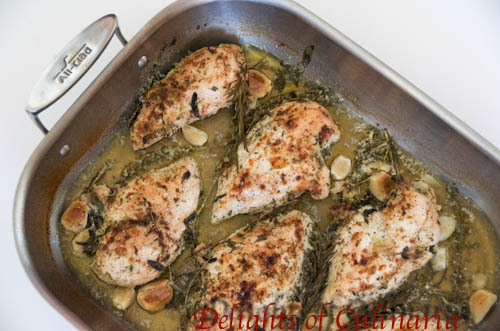 Drizzle some olive oil over the chicken. Bake uncovered for 25 min.then take it out and using a spoon, pour water that's on the bottom of the pan over the chicken.Repeat one more time in 20 min. Continue roasting for another 10-15 minutes. Total time 50-60min. When chicken is done,discard herbs. 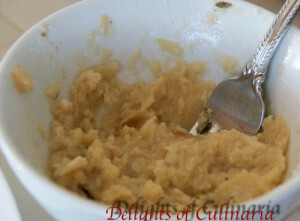 Take out garlic cloves and mash them with fork. 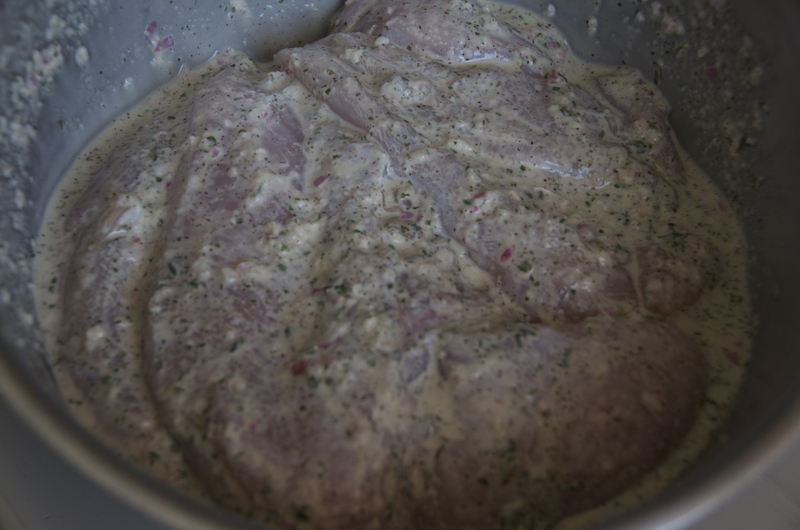 Spread mashed garlic on top of chicken. Slice chicken in the pan and pour the liquid over chicken. The chicken looks absolutely amazing! It seems like a perfect recipe when entertaining! Thanks for stopping by my blog! Your got yourself a new fan! Thank you so much!! !It sure is perfect for entertainment.I’m a fan of yours too.